Whether a system like SPECTER will be appreciated by its users is in part a question of understanding and trust. It is therefore indispensable to provide an appropriate means for the user to learn about the records and models that the system has built up about her. Techniques such as textual, tabular, or graphical presentation seem unlikely to be adequate in themselves: First, the amount of data captured by SPECTER and the complexity of its user model will make exhaustive or unguided inspection infeasible. Second, it can seem unnatural or inappropriate for a machine to comment to a human about the human’s (sometimes emotional) reactions to events and to actions of others. So on the one hand, processes of reflection and introspection need to be investigated that allow the user to access and adjust SPECTER’s records and models. But at the same time, factors like the manifestation of empathy, emotional argumentation, and the system’s apparent sincerity need to be addressed. The emerging techniques will let SPECTER present observed emotional and behavior patterns in an affective way, taking into account an evolving longer-term user-Specter relationship. In turn, the user will be allowed to annotate past situations in terms of her own emotional responses, supplementing and perhaps correcting the automatically generated records of affective states. Here we give a short overview of our concept for reflection and introspection and have a closer look on a special case how a user interacts with the system to determine automated service triggers. The setting for reflection and introspection is that the user collects data with SPECTER in her daily life. Then SPECTER provides a interface on the handheld which enables the user to make restricted interactions like browsing or ratings. She can use this for example when sitting in the train or having spare time. The full functionality of reflection and introspection can be accessed by the user at a desktop PC, for example when she's at home, reviewing her day and helping the system to improve its understanding. Reflection and introspection can either be started by the user or SPECTER. If the user takes the initiative, we have navigation and retrieval in the personal journal and the user model. The user can choose different views, filters and services. She can also manually rate events, like the meeting this morning was very important and she can correct false automated categorizations from the system, which gives SPECTER the chance to improve interactive its user model. Automated categorizations will be indicated by a special icon which can be inspect by the user. Nevertheless the user is not forced to do so and can decide by her own how much time she wants to spend in training the system. 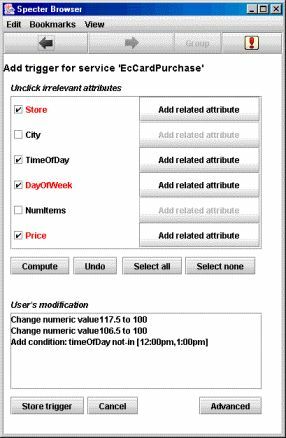 SPECTER also provides an explanation for automated categorizations of events which the user can request. If SPECTER take the initiative he can ask the user about events he couldn’t categorize. By that the system can learn about membership of events and also new categories, like names of emotions. SPECTER can give a summary and explanation of its learning progress, such as presenting important events of the day and interpretations of them. During idle time, SPECTER can also start a dialogue with the user to improve the user model. For all this services it is important that the frequency of such question are limited or can even turn off. The system should also figure out which are the important questions to achieve the best improvement for the user model. SPECTER provides several services to the user, like using external devices, sending emails or checking bank balances. The user can start this services manually. But it would be desirable if SPECTER could recognize which services the user start recurrently and trigger them by itself. But then the question arises what is the appropriate situation for such a trigger? For that SPECTER can have a look on the personal journal and user model and use domain knowledge like ontolgies. He proposes such a trigger to the user who can criticize it and help SPECTER to find a better trigger or she can modify the trigger according to her ideas. The figure below shows in detail how a trigger can be determined. The decision tree on the left means that an EC-card purchase will be likely occur, if the store is edeka and the price is greater than 117,5 Euros. A decision tree depends on the attributes which are involved with it. 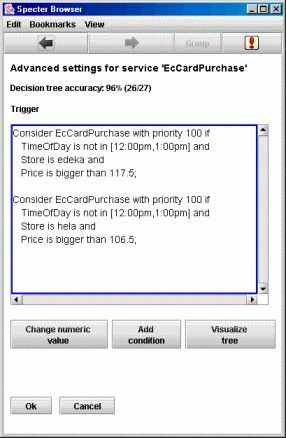 If the user says that the specific store shouldn't be important for this choice, we get another decision tree which depends on price and timeOfDay. If the user has determined which attributes are relevant for triggering the service, she can modify it according to her own ideas. This includes eliminating irrelevant attributes, selecting paths from the tree, modifying split decisions, and adding new conditions. 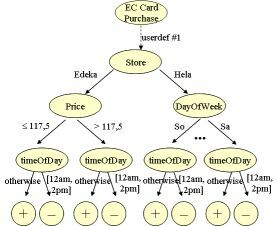 In the example above she has chosen the first decision tree and has added the attribute timeOfDay. Such a decision tree can be stored and also be checked how accurate its predicted results are. Furthermore, the system can point out bad rules which the user should modify. The trigger editor is an application for building such triggers. It’s implemented as a viewer instance which runs in the SPECTER browser. 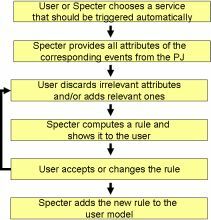 SPECTER presents the user a list of attributes which are related to the service. The task of the user is to uncheck the irrelevant attributes. She can also add related attributes according to the ontology. After that the user presses the Compute-button and SPECTER computes a trigger and indicates its attributes by red color. Now a trigger is already determined and can be accepted if the user don’t care about details. For a closer look, the user presses the Advanced-button and gets an explicit semi natural-language representation of the computed trigger. She can modify the result by changing numeric values and adding new conditions. The user can also inspect directly the underlying decision tree. 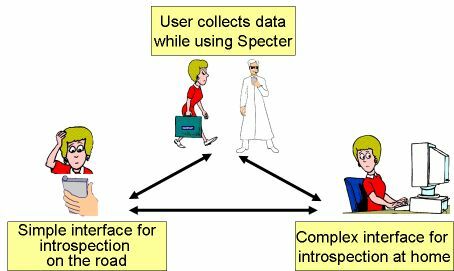 Components and processes related to reflection and introspection are embedded in SPECTER's introspection environment, which enables the user to perform the introspection as described before. Its main components are a virtual character, a presentation screen and the journal browser (see the screenshot, from the left to the right). The virtual character guides the user through the introspection. It offers services for the exploitation of recorded memories such as the retrieval of additional information about mentioned objects and the adjustment of service triggers. Here the character serves as the system’s "voice" if the system has to acquire proactively information from the user.